Before you begin: Take your neck measurements; you will find that the cotton has a little give in it, so don’t be generous or your choker will slip! Please note that the lace-effect is only worked on what will be the top and bottom edges of the choker, not the sides. Take the black cotton and cast on 6 stitches on the 3 ¼ needles. Repeat Row 2 until your work measures the measurement you took for your neck minus 1.5 cm. Repeat Row 2 for 1cm, then cast off. ss1, into corner row end, [c3, ss1 into row end,] repeat brackets until the end of the choker is reached. Repeat above with the bottom of the choker. Sew in ends, and then sew on button and pendant / charm. 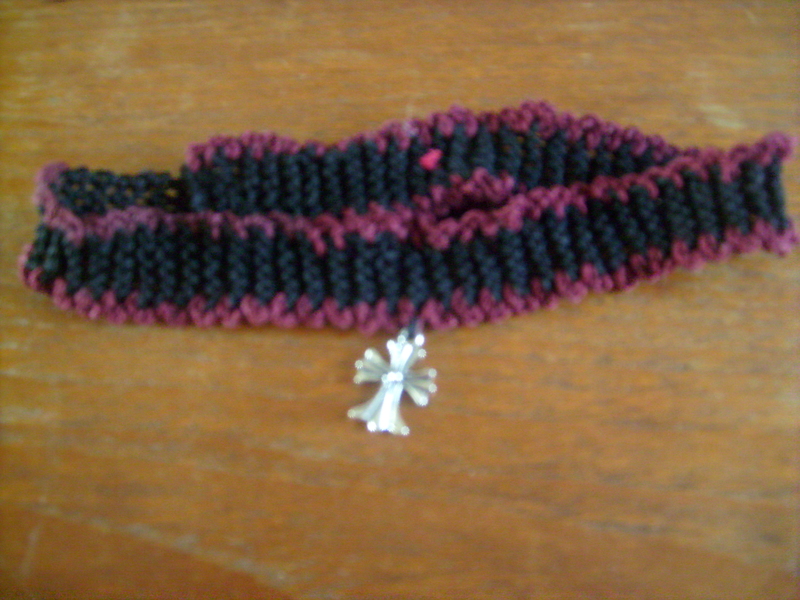 This entry was posted in Hearth Witchcraft and tagged craft, crochet, crochet pattern, gothic, hearth witchcraft, victorian choker. Bookmark the permalink.